Sorry I have been MIA! I have been super busy with the beginning of the school year. I have been working long days and getting up early. I was so tired this past weekend I just needed a break. This past weekend I went to Target with my mom and came home with this sweater. I wearing my heart on my sleeve...acutally all over. :) Love it! I bought two different ones! This one and another! I wore this outfit to work yesterday! Super comfy and I cannot wait to style it again! Don't forget to link up tomorrow! Elle and I are styling denim! Love the sweater - very sweet! I love the sweater! So fun. Such a cute outfit. Love, love, love the sweater. 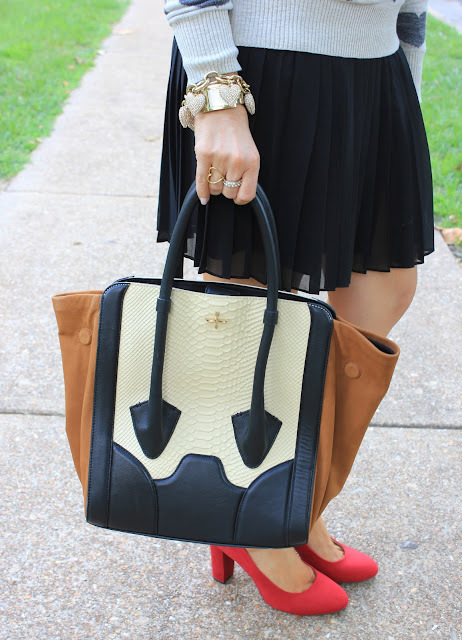 Don't forget to stop by and link up tomorrow for my weekly thursday tres-chic fashion link up. Love it! You look so adorable. I got a sweater from Target last year with a big heart on it and it is one of my favorites! Love it with the skirt and red heels. Hope you are having a good start to the school year. Love target stuff! I always find something every trip I make! Busy start to the school year! Hey there fellow special ed teacher! Who knew?! The entire outfit is so pretty. You put it all together perfectly. Love it! I have been drowning in paperwork these past few days! Hence, lack of posts! I wore this outfit to school and wanted to share! Thanks Ainslee! It is super comfy! Thanks Elle! Target has been a real winner for me lately! Loving their new items! I need to stop going so I am not drawn to the clothes! When I saw this bag on your Instagram I knew I just had to get a closer look! It is fabulous! I imagine it goes with absolutely everything. I may have to invest in one! Thanks Alicia! I love this bag! I was able to score this bag at the Nordstrom sale a few weeks ago! I love that I can use it all the time. Matches so many things! I love that sweater and those shoes. Along with your leopard pumps, I want to get all 3 pieces from Target. Plus I do not own anything in a heart print. This outfit is adorably girly. I even have a similar skirt. You are inspiring me here.